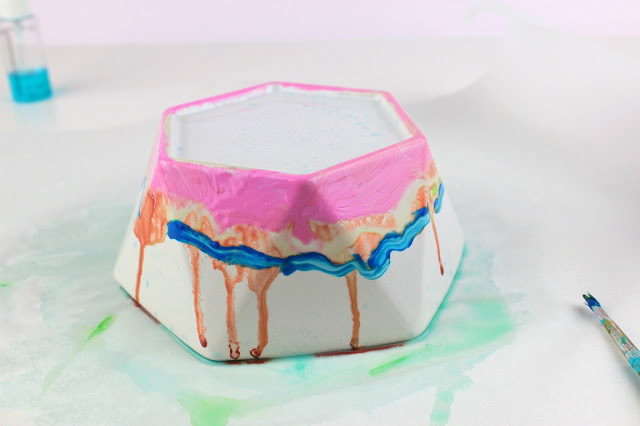 Diy Watercolor Marble Ceramic Bowl! I have a habbit before going to sleep! what is that? I spend every night at least ten minutes checking pinterest! Bad habbit I have to admit, because everytime I see something interesting, I want to try it! And if I have already the materials, there is no problem…but guess if I do not have them! This time I was checking all these things you can made with the Watercolor tecnique and I really liked the Marble Colors on them! Everywhere actually! That was it… I had to try this and I knew from the beginning where to try it on! 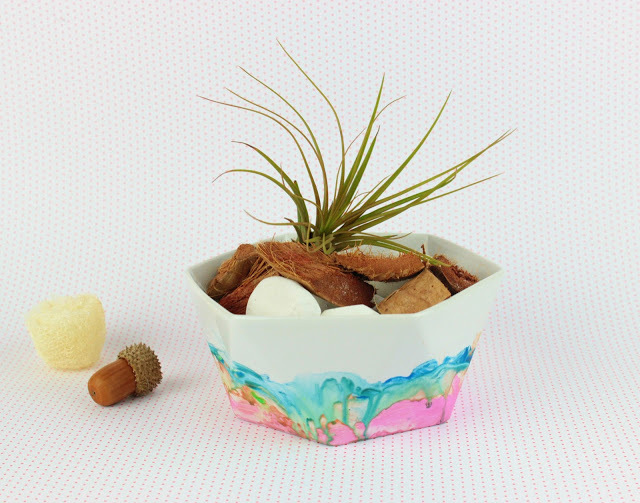 My new Ceramic Bowl was just perfect! This is the perfect way to get dirty and at the same time to enjoy it! 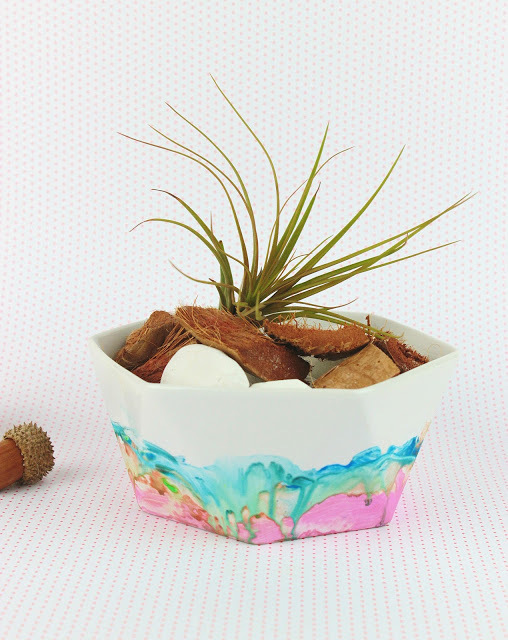 Also, is the perfect diy for your kids! They are learning how to mix colors and they can draw whatever schema they wish! No pattern, just colors! So, put a cooking paper on the table or something to keep your table clean and now you can start. Put the alcohol on the mist bottle and spray the bowl, letting the bowl stay a little bit wet. Immidiately paint with the colors in any schema you want…actually without any schema. Just aply with your paint brush your colors and then apply more colors and mix them up. 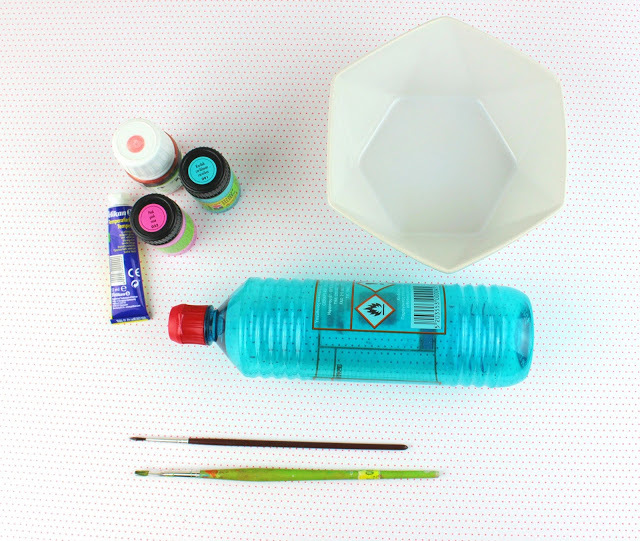 If you want to create more the marble style, you can add alcohol again after painting it. But just little of it. Let it dry and then cook it for 2-3 minutes in the oven. This will make your color stable. And now, we are ready! 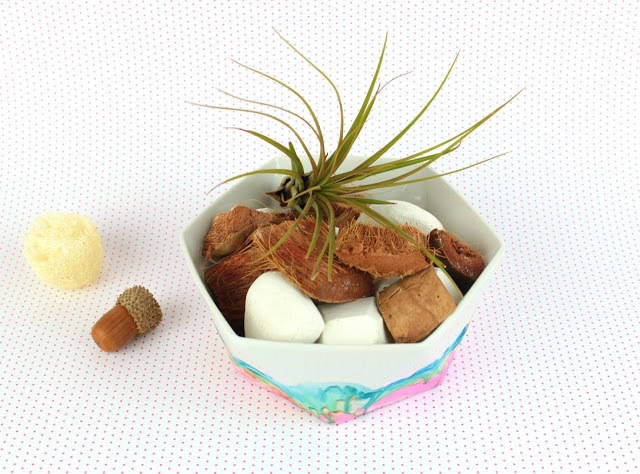 I wanted mine to use it for my office desk, so I have put inside my Aromatic Diamonds and then to have it more natural, my other beloved airplant, my Tillandsia Concolor! And my desk is full of color now and I really love it! And what about my little helpers??? Well, they loved so much this craft that we have decided to try it on Ceramic Mugs too and to offer them to our teachers! The perfect handmade gift from the little one! So have you tried this technique in any creation? και ένα απλό μπωλ…μετατράπηκε σε νεα ενδιαφέρον διακοσμητικό γεμάτο χρώμα! Έλεγα και εγώ στον ύπνο της τα βλέπει.. ε κάτι παρόμοιο γίνεται από ότι κατάλαβα! Πολύ μου αρέσει η νέα τεχνική! Θα το δοκιμάσω στο μπαλκόνι γιατί είμαι ικανή να βάψω όλο το σπίτι! (Χρυσό το έχεις κάνει το Tiger!!! χαχαχα) Ωραία τεχνική και με απλά υλικά (που διαθέτει κάθε σπιτικό που σέβεται τον εαυτό του!). Μπαίνει στα υπόψιν οπωσδήποτε!!! ε ναι…αξιόπιστο και οικονομικό και με πολύ όμορφα πραγματάκια, σκέτη γλύκα!